The radial engine is a reciprocating type internal combustion engine configuration in which the cylinders point outward from a central crankshaft like the spokes on a wheel. This configuration was very commonly used in large aircraft engines before most large aircraft started using turbine engines. In a radial engine, the pistons are connected to the crankshaft with a master-and-articulating-rod assembly. One piston, the uppermost one in the animation, has a master rod (Red on the animation) with a direct attachment to the crankshaft. The remaining pistons pin their connecting rods (Yellow on the animation) attachments to rings around the edge of the master rod. Four-stroke radials always have an odd number of cylinders per row, so that a consistent every-other-piston firing order can be maintained, providing smooth operation. This is achieved by the engine taking two revolutions of the crankshaft to complete the four strokes, (intake, compression, power, exhaust), which means the firing order is 1,3,5,7,9,2,4,6,8 and back to cylinder 1 again. This means that there is always a two-piston gap between the piston on its power stroke and the next piston to fire (i.e., the piston on compression). 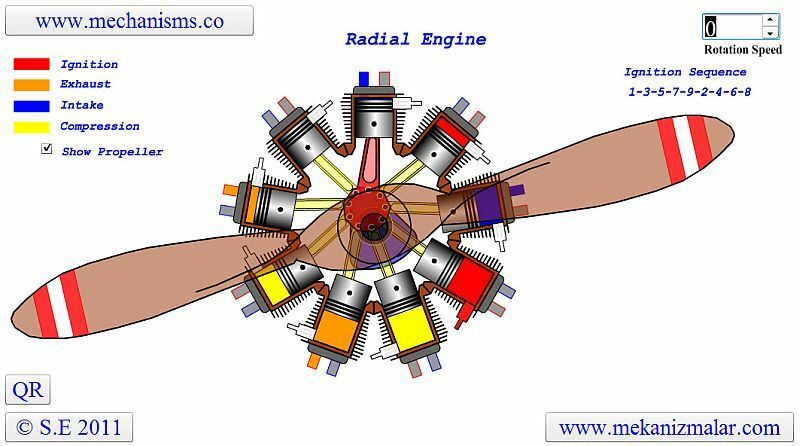 Note that colors (Red, Orange, Blue and Yellow) showing engine operation distributed evenly on the image for Radial Engine. For the Rotary Engine (Red and Blue) are on the left and (Orange and Yellow) are on the right of the image. Most radial engines use overhead poppet valves driven by pushrods and lifters on a cam plate which is concentric with the crankshaft, with a few smaller radials, like the five-cylinder Kinner B-5, using individual camshafts within the crankcase for each cylinder. A few engines utilize sleeve valves instead, like the very reliable 14 cylinder Bristol Hercules and the powerful 18 cylinder Bristol Centaurus. Attached video is Acad Inventor animation of a radial engine. This video shows how the overhead poppet valves and pushrods works. a friend of mine is milling a small edward's radial engine plan & the cam profile is not included. can you advise on how to calculate the duration .070 & .073 lift on a 5 cylinder?